Today was the hottest day of my entire life. I could not imagine how I survived in such an unbelievable day when the temperature skyrocketed to almost 40 degrees Celsius. And i thought the Philippines was undeniably warm. To tell you honestly, the only thing that kept me going was the reason to discover Brunei, my 20th country in Asia. I arrived the night before at Bandar Seri Begawan International Airport, with just my backpack and my treasured wooden box i bought in Thamel, Kathmandu. The rest of my luggage was tagged direct to Manila. I reckon this was a really good idea so i don't have to worry about carrying with me three huge bags in my escapade to Brunei. Later on i would realize, this was a big mistake. I've heard not so good stories about Brunei, and most, if not all of my friends say it's the most boring country on earth. The reason why i still wanted to go is because i want to prove everybody wrong. I haven't set foot in this country, so i want to know the real answer myself. Of course, when 10 out of 10 people agree, then it must be true. I slept that night at the airport. Yes. I did. I still have some money with me to pay for a taxi, and book a room for the night. But i didn't. I arrived at the airport, and met about twenty Filipinos right away. Filipinos work in the airport, either as cleaning staff, concierge, store attendant, etc. And dare i say, the only saving grace of this country. I met this Filipino guy who was working on the night shift. He was the one who advised me not to check in at a hotel at the hour i arrived. "Trust me. There's nothing to do here", he said. Still not believing what he told me, i planned my next day rendezvous googling for places to see. Of course, there's not much apart from a couple of mosques and water villages. The airport has been under construction for years now. It's small but clean. Thanks to the Filipinos tirelessly sweeping the floors every few minutes to ensure that Brunei gets a good first impression from travelers. I woke up the next day with still not a lot of people. Ha. Yes, there were passengers on stand by as most international flights to Melbourne and Kuala Lumpur leave early in the morning. I sat, and stared at people lining up, going to the terminal, and flying out of Brunei. This repeated for almost a hundred times until i finally said, i am going out to town. Another Filipino I met helped me store my backpack in the room. Now, with just a hand bag and my leather jacket with me, i finally went outside to get a feel of this country. Five minutes later, my cigarette not even finished, i went back inside. The heat of the day was scorching. It's unfathomable. I grabbed some breakfast and sat again. I was undecided to still pursue the trip to the city. But i managed like an addict, and totally killed myself going out to town. I met one Filipino who said that instead of riding a taxi, i could just totally wait for the public bus passing by the airport that ends up in the middle of the city. And so i did just that. I ran to ride the bus, where more than half of the passengers are Filipino. I paid the woman one Brunei dollar, and stared at the surroundings. It's not your typical South East Asian country where noise is astounding, surroundings arguably dirty, and the people always smiling. First impression of Brunei is that it's too hot for a normal person to handle. I found the people very stiff. The surroundings are clean, but then again, there's nothing outside of mosques. When i arrived at the bus station, i went out for a cigarette break. It took me fifteen minutes to find a spot, where again, i didn't finish my cigarettes. I found that i could totally give up my smoking because the temperature in this side of the planet is unbearable. Finally, i found a seat at the park adjacent to the water village. It's nice to see water, but i reckoned it helped to make the temperature even worse. The bridge was impeccably situated with a good view of the market that day. Every Friday, KG Kianggeh Open Air Market turns into a throbbing spot for locals to sell Malayan food, vegetable produce and fresh seafood. After battling the crowds, i arrived to a junction that goes back to the highway. By the Kampung Water Village, a couple of locals sell a trip on to the opposite side where hundreds of houses built on stilts can be found. I declined, although i know i could help these men by simply taking the underwhelming trip. On the southern exit from the Jalan Cator bus station, one could walk to Sultan Omar Ali Saifuddin Mosque. It was beautiful but i didn't feel the need to stay too long. The picture above explains how every few seconds clicking the camera, i ran for shade. I was melting like cake in downtown Bandar and it was not a pretty sight. On the other hand, what's particularly nice about crossing the streets in Downtown Bandar is that the cars literally stop for you so you can pass by. I've never seen anything like it anywhere in Asia. This rule deserved a thumps up for me. The security guard by Sir Muda Omar Ali Saifuddin Park was also extra nice to me. He even pointed me to a good spot so i could take a decent photo. When i came back, after a few minutes of photo shoot, i said my thank you and moved on. Seeing Jollibee at Yayasan Shopping Mall was a dream. Eventually, i found myself inside lining up to place orders. However, i was told that they only allow take-outs as the Friday prayer was coming up in an hour. The reason why i wanted to dine in is to cool off. So i left the fast food chain, and decided to explore the mall instead. I found that most of the shops are starting to close. I just bought a couple of quirky magnets for home and decided to leave. At this point, i was breaking up into tiny molecules because of the gravity of the heat. I found a quiet spot by one of the parking lots and sat there for minutes contemplating where else i can go. For the first time in my adventurous life, i have given up. I am pretty sure Brunei is a terrific country to visit. But my personal experience, proved otherwise. I find it now painful to realize that this country so rich, could not afford more reasons for me stay. I look back with what my new Filipino friend said at the airport. He was right all along. I rode the bus an hour later, going back to the airport. I still had a couple more hours to spare, but i knew i was ready to say goodbye to Brunei forever. In a few years, i may decide to come back and explore the region closest to Borneo. Bandar Seri Begawan is totally out of the picture. I came back to the airport and started chatting again with the Filipinos. I've never met so many Filipinos at a given time. All of them talked to me like their long lost relative. They've been helpful from the minute I arrived until before i leave. When the Royal Brunei Airlines counter was finally open, i fell in line and learned that i was a few kilograms overweight. I tried to argue that i flew from Bangkok with the same baggage but i was not fined. But since i wanted to leave the country already, i paid an unbelievable price of $20 for my excesses. When i was screened, i was told that i had to leave my deodorant. I told the man that it's almost finished, and definitely not the 100 ml maximum limit for liquid as per rule in any international airport. When i tried to explain that it's for personal hygiene, he walked up to me and became very angry. He told me, "do you want to leave or not?" He also added, "you don't smile at me, i am just doing my job.". I kept silent and walked away. I never bothered to argue because even if i did, he wouldn't understand me anyway. Of course, he was trained to be closed minded. He was right when he said he's doing his job. I wished i could have told him he's doing it the wrong way. I went to find a seat as i wait for my flight to Manila, still thinking of my experiences in Bandar Seri Begawan. Surprisingly, i felt calm and at peace. It's good to be surrounded by happy Filipinos eagerly awaiting to leave Brunei for the Philippines. There's obviously something wrong with the picture. Just like the man who tried to hold me because of 10 ml deodorant, i didn't bother arguing. This goes out to the lady who fined me for excess baggage when i am just transiting in this country, i smiled and paid right away. 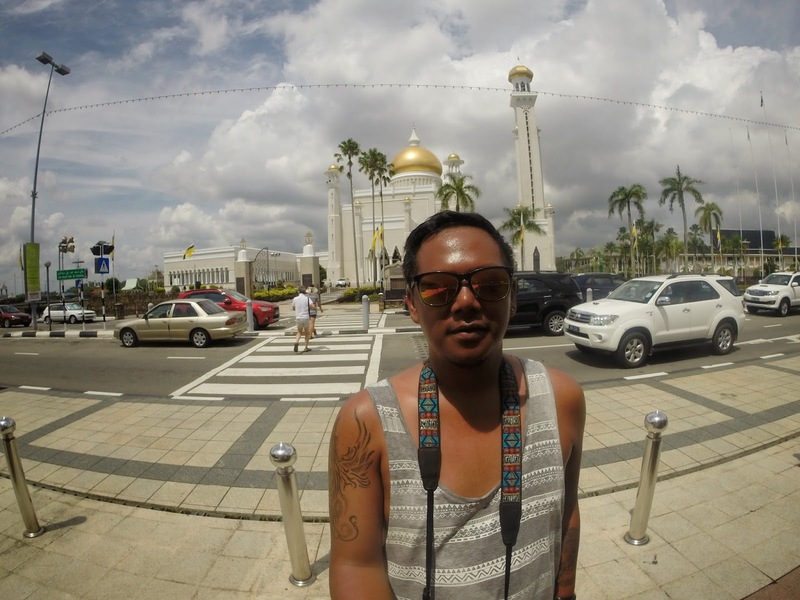 To sum it all up, i will never talk about Brunei Darussalam after this blog post. I swear. There's no use arguing when the other ear is already closed, just like this country. P.S. Want to know the icing in the cake? Royal Brunei Airlines lost my baggage. The luggage that has been tagged direct to Manila (MNL) was actually transported to Melbourne (MEL) by their staff. After almost a week of waiting, i finally got reunited with my bag, with no compensation. I arrived in Manila from my two-month backpacking trip across Malaysia, Nepal, Thailand and Brunei. It surely felt so good to be back HOME. Brunei Darussalam is a South East Asian country among the islands if Borneo. This country is packed with numerous attractions which tourists would surely love. Perfect for people who have an immense passion for museums and beaches. I'm also looking at this country in some blogs and they tell the same that nothing is memorable to see here. But the mosque which I think becomes it landmark is one of the spots to visit. A defunct travel show, Pinoy Meets World featured it years back - one of the activities they did was cultural immersion and forests trekking but still not entirely convincing for a worthy visit. I've been eyeing on this country for quite some time now. I met someone who is actually from Brunei and told me there are a lot of Filipinos working there. I should probably bring a umbrella too when I get there. I'm ready to be disappointed. But still hoping for the best experience tho. Thanks for sharing your experience. @ Luggage Scale I thought so, too. @ Elainne Catalan I wish you good luck on your trip to Brunei. Don't expect too much so you won't get disappointed. And don't explore on a Friday, please. Cheers! Thanks for visiting my blog.